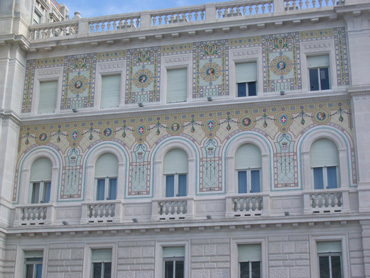 The grandeur of urban Trieste was in our sights. From the mountains to the sea: it was a journey we'd extend to a week; a journey our motorcycling alpine host said he'd make in a couple of hours. Behind us were the idyllic Italian Dolomites, the eastern Alps, with their first snow of the season; ahead was Trieste on the upper tip of the Adriatic, a branch of the Mediterranean. Once both regions were contained within the Austro-Hungarian Empire, now they look and sound worlds apart. In the mountains Ladin, the traditional language of several of our favorite high valleys was dominant. When I spoke my rough Italian to clerks there they often replied in German, their second language. Italian was usually their third choice of the 3 official languages. In Trieste, Italian was the spoken language though signs bi-lingual with Slovenian reminded us of the borders redrawn at the end of WWI. In the mountains, an adherence to tradition and presumably strict land use laws had preserved the vast rolling meadows in which the villages had expanded to become ski resorts. As an afterthought, one realizes that car parking and other unattractive storage problems were solved by burrowing underground to leave the summer hay pastures undisturbed--pastures that became neighborhood ski runs ending at the doorsteps in the winter. And conformation to the ubiquitous mountain chalet building style successfully camouflaged the few local industrial parks. The effect was enchanting as one's sense of being in nature was barely disturbed by the equally welcome modern comforts. 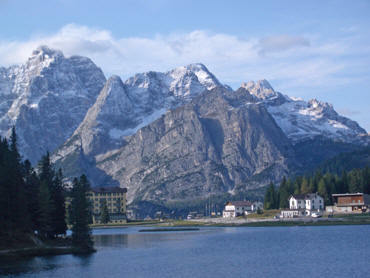 The Dolomites were always in our "from the balcony" views. 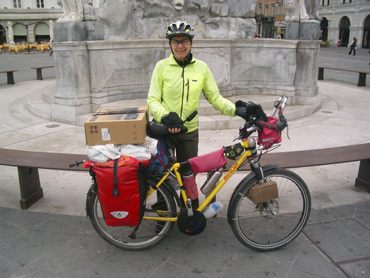 In Trieste and on our approach to it through the progressively flatter lands, we felt slammed into the harsher reality of the normal world. Soothing images of dramatic mountains and dreamy meadows no longer filled our heads but instead it was the buzz of traffic and the sight of roughly treated land that was jarring our beings. The grand peaks and sheer faces that had been constantly in sight were now replaced by rounded-down, ordinary hills. In Trieste, instead of a mountain panorama from our balcony as we'd enjoyed each night in the Dolomites, the view out the single window of our thrown-together B&B was of a fresh-air filled interior stairwell. Gone was the cozy mountain charm that had been so calming; instead it was the sense of confinement in the city canyons that overwhelmed the serenity of the adjacent sea. But the chill in the air that continued at lower elevations again reminded us that it was time to be out of the mountains if our last snowy hike hadn't been urging enough. The wind and overcast skies had made even seaside Trieste harsher than we'd hoped and we shivered at the thought of another wet, cold fall along the sea. One of those well-designed Slovenian bike paths. The hotly contested ancient city of now-Italian Trieste directly borders with Slovenia though we took the more circuitous coastal route out of Trieste through neighboring farm land. This northern most region of the former Yugoslavia, Slovenia, always impresses us and the warmer weather the day we rode the few miles from Trieste across the uncontrolled border into Slovenia only exaggerated the prior postive impressions. The white puffy clouds against the soft blue skies reminded us of Provence and the Impressionists' love of outdoor light. The welcome warm, gentle breezes reassured us that a string of lovely days could lie ahead. The 'kick back and enjoy' lazy energy that had tugged at us when on the Costa Brava in far away Spain was in the air. As the spell cast by the shirt-sleeve weather along the quiet coastal road was broken by entering more demanding urban terrain, my noticing shifted from being absorbed by nature to scrutinizing the changing cultures. 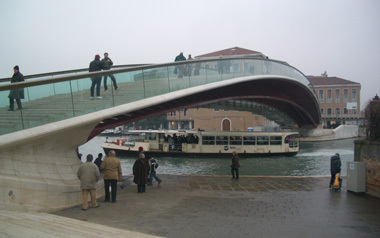 The troublesome new Venetian bridge. Slovenians always strike us as a people with a long 'just do it' tradition, a tradition of high energy. The hundreds of weekend sports people out on the bike routes when we arrived reinforced that impression. Their spirited-tempo rather than leisurely paces were more reminiscent of the sporting energy in the Italian mountains than the strolling affect of Trieste's cafe culture. We soon recalled our experience last year of the energized ambiance in Slovenia's Julian Alps--energy that survived the journey down to the sea, unlike in neighboring Italy where evidence of the Alps sporting mentality fizzled before the land flattened out. 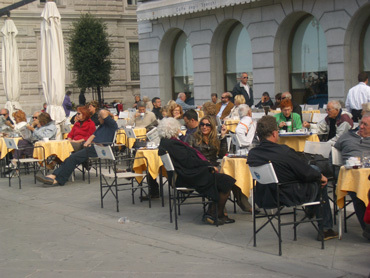 Sunday morning in a Trieste sidewalk cafe. The more energetic attitude was evident indoors in Slovenia as well. I requested a different room at our Slovenian hotel as the no-smoking room reeked of stale fumes. The sympathetic hostess gave me keys to 3 other rooms so we could take our pick. Her focus on solving the problem quickly and efficiently was quite a contrast to several hotel hosts in France and Italy where we walked away when the host or hostess wouldn't allow us to see a room by ourselves nor would they accompany us to preview a room before renting. We always love the welcome reception we receive in Slovenia even though the un-guessable Slavic language on the signs is off-putting. But the many bi-lingual locals reduced the language barrier, as at the hotels, and ultimately it was the short list of sightseeing destinations that once again had us breezing through a corner of the country on our way to Croatia rather than lingering longer as we did in 2007. Our quick physical transitions from Italy, through Slovenia, and then into Croatia coincided with our electronic transitions as we finally declared our ailing laptop as irretrievably comatose. It still responded with whirls and chimes to each of our hundreds of taps on the start button but its display was limited to a colorful pinstriped screen which inhibited a meaningful dialogue with it. Our 'essential' tasks instantly ground to a halt. The special software needed for this web page was inaccessible on the laptop and not available at internet shops. Production of the webpage updates would immediately cease for over 2 months. Instead, unformatted notes would be 'thumb-boarded" by my flying thumbs onto my tiny PDA keyboard until the laptop was repaired in mid-December. Bill's slick system for internet connection of the laptop via cell phone was sunk. Internet access would require regular visits to smoke-filled cafes for the next 10 weeks to maintain our e-mail correspondence. And hundreds, if not a thousand, yet-to-be-taken photos would go unculled and instead be dealt with as a mass months later. Bill's new GPS was shelved as without the laptop there was no way to load maps stored on the hard drive onto the device. Gone too were the niceties of having a daily route with lodging choices designated on the guidance system. Bill was back to his heavy reliance of printed maps--maps that weren't always available in the quality or detail he needed. New storage routines would have to be worked out for archiving and backing up the accumulating photos and the megabytes of information being stored on our PDAs instead of on the laptop. And keeping our PDA's safe became even more important as their data could no longer be backed-up to the computer. There was no way to view the remaining DVD lecture series stored on the hard drive and accessing treasured reference materials like dictionaries and our encyclopedia suddenly stopped. Online research and use of the internet phone for making appointments back home would all but disappear aside from what could be done at shops. Paying by the minute at unpleasant internet points would also discourage us from using the internet to catch-up on the news. Suddenly it was back to the traveling life as we knew it in 2001 when the only electronic gear we carried were our PDAs and second-hand smoke was a regular part of our evening diet. We finally abandoned this box for mailing the laptop home. We debated for weeks before its final demise about sending the laptop home for servicing while we scrambled to optimally position ourselves before the likely final crash. The estimated $500 for round trip insured express shipping for warranty repairs made us gag but it was the lack of confidence in a certain repair that convinced us to do without for the next 10 weeks rather than to ship it home. We'd sent our 2 Fujitsu's in for servicing almost every year with less than 100% satisfaction and we surmised that the results would be even worse with Dell's house call service which would lack the additional quality control of a factory setting. This would be our first experience with non-factory servicing but we easily imagined that full satisfaction relied on the owner providing the final quality control step to make sure that the technician had double checked that everything was running perfectly. The diagnostic tests Bill had run suggested that there were multiple problems and our $500 gamble was looking like a bad investment if we weren't there to birddog the fix. And then there was the worry about the less likely risk of the computer being lost or further damaged in transit. There was one reprieve in our missing services, which was gaining some internet access using Bill’s cell phone. It was an option he'd considered in Italy but our high speed access for the laptop hadn't made the experiment a priority. But no longer having a functioning laptop or any predictable internet access of course tipped the balance towards trying to use his PDA for emails. internet shop never opened their doors. It was a bit of a Catch-22 however as he needed an internet shop to obtain some technical info to make the phone work for emails. Even then the clerk selling him the phone chip was doubtful that he'd pull it off as the clerk could offer no help in determining the proper settings needed. Matters were further complicated by 2 of the 4 internet points in the city being out of service indefinitely and the other 2 were shut for an unexpected holiday--a common problem. But Bill was highly motivated as being able to check our emails on his PDA/phone would dramatically enhance our stay in Croatia. Scouting for the rare internet shop could move from the top of each day's list down to the 'use as available' level of concern. Big projects and surfing would wait for full-sized screens and keyboards but at least we could count on keeping current with business matters as situations warranted with Bill's PDA approach. (A bit out of touch these days, I haven't actually seen a Blackberry but imagine our set-up was similar to these devices). It was on the same day we each spent our first 2 hour stint in an internet shop--ducking out just as the loud teenage boys were setting up for a group gaming session--that Bill downloaded his first batch of emails onto his PDA phone. This capacity to access the internet through the cell service was a huge relief to us. Improvising and compromising would continue for weeks as we adjusted to this unpleasant resource constriction created by our laptop becoming dead weight. Ten days into our southbound journey along Croatia's coast one of my internet shop chores would be calling up our webpage to retrieve information from our Country Details file for Croatia. In writing those files over the years I was always very conscious that some of the information was being conveniently stashed for our future use and some of it was for site guests. The surprise however was accessing the details like a guest as we were no longer able to access that information (or edit) as site owners. 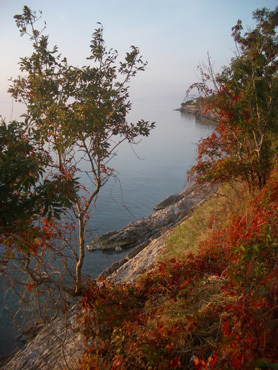 The coastline of my autumnal Croatia. A vibrant fall palette in the small-leafed Mediterranean scrub greeted us as we crossed the border into Croatia from Slovenia. Admiring the splash of color against the rocky land and sea, I realized that my image of Croatia is that of a country stuck in perpetual fall. My Croatia is an autumnal Croatia. But mine is a minority view as Croatia is noted for its sizzling summers--the one season we carefully avoid. High heat spells misery for us as cyclists but it is the throngs of welcomed visitors filling the miles of narrow, shoulderless roads that scare us away as high-season tourists. Better to feel the chill in the air than rack-up too many close-calls competing with cars for the scant asphalt. One of many trilingual lodging signs. As we approached the first settlement my attention was turned from the colorful, stunted roadside trees to the parade of trilingual signs lining the northern Croatian roads--signs that underscored the importance of tourism. Of course the first language on the signs was their own but the other 2 weren't chosen from the long list of local dialects as might have been done elsewhere but were the languages of their most important guests: the Italian and the German speakers. The languages on the signs were also those of their former oppressors but the license plates on the road reaffirmed the modern story as Austrian and German cars were swarming even in October and the Swiss, Dutch, and Italians were making their presence known too. 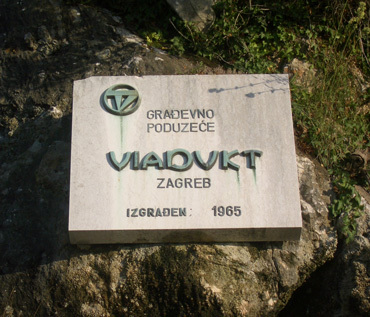 Tourism has been a huge business for coastal Croatia since the first paved road linking the villages was opened in the early 1960’s. Crossing the border from one country to the next is often a chaotic time for me as I consciously shift my attention outward to scoop up more impressions and simultaneously heighten my inner awareness to process the experiences. Places like the Dolomites and Slovenia reward my heightened sensitivity with pleasant initial images and comfortable secondary conclusions. In contrast, more Mediterranean or lands farther east, like Croatia, quickly become disturbing. Plaques commemorate the first road, the new prosperity. The fall colors were of course a pleasant first image of Croatia but the trilingual signs, often announcing lodging, reminded me of how difficult life in Croatia is for so many. We knew that more than a few of these signs were for painfully meager accommodations offered by families longing to supplement their incomes by hosting tourists. Some would further boost their profit margin by dodging taxes on the transaction and these urban dwelling entrepreneurs often raised much of their own food in their front yards. 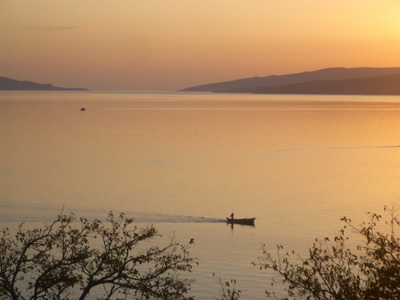 I suspect that Croatia is especially disturbing to us because its people have been influenced by 2 negative forces: the general careless regard for things (especially the environment) that is typical of the Mediterranean cultures plus the Croatians carry the remnants of low quality standards and expectations so typical of the former Eastern Block countries. As Bill noted, the resulting picture in Croatia is like that of a puzzle where the the pieces don't all fit together. 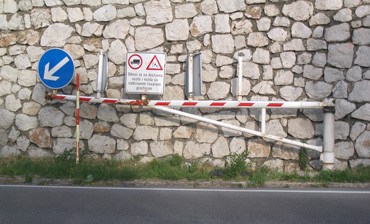 For example, it was common for the exterior of a well-built, private Croatian tourist accommodation building to be freshly painted and have gleaming stone outdoor staircases with stainless steel railings but inside the furnishings would be very low quality or an assemblage of leftovers. Making-do when the path to town fizzled out. One village had created a nice strolling path along the ocean but a connecting segment was never built so pedestrians usually either turned around or climbed up to the main road and walked to the next section on the narrow road in truck traffic. In Croatia, stopping at a rare highway pullout so as to more fully admire the ocean view generally meant having to look beyond the rusting appliances and other garbage dumped down the bank from the rest area towards the sea. Our first overnight stay in Croatia in 2008 was in Umag and the next morning its tiny central square was bustling with locals lingering over coffee and cigarettes in fashionable outdoor cafes. But the backdrop to the side of one cafe was of a poorly built commercial building still in use but in disturbing disrepair. This odd juxtaposition of superficial fashion against decaying structures was common in Croatia. In Croatia it seemed that just below the surface of almost everything we saw were signs of struggle or of chaos. The patched together infrastructure, the general lack of orderliness in private spaces, and the haphazard care of the environment made us cringe. In Senj a shopkeeper stepped out of his store to pitch a wad of scrap paper onto a recently swept square and in another village children left a trail of garbage behind them as they walked. Some street cleaners were left to blindly reach into awkwardly constructed litter bins to empty them by the handful and recycling of any sort had yet to catch-on. "Why can't they just ....." was always on the tips of our tongues while in Croatia. 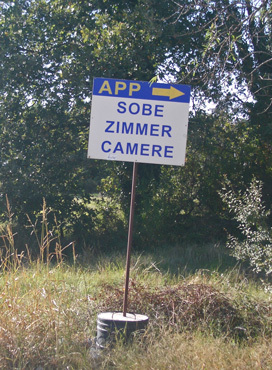 Another perplexing picture in Croatia was the pricing structure of goods and services. The government now pegs the Croatian kuna to the Euro, though the government uses a more profitable rate during the lucrative tourist season. But even so, the relative pricing of goods and services seemed bizarre. Eastern European carrot-rot is like nothing we've seen at home. As I surveyed the harsh contrasts I thought back to the market I'd just visited inside the tattered building and was aghast that people were paying as much as $5 a pack for cigarettes. Prices in the grocery were all high and I declined regular menu items for us that were double the usual EU prices. Adding to the pain of the prices was the often poor quality of the goods available. Doing the math in Croatia repeatedly resulted in 'It doesn't add up.' Our 1 bedroom apartment with a balcony, equipped kitchen, heat, and satellite TV was $47 in a town where the pack of cigarettes was $5. As before when in Croatia, I wondered how people managed, but I knew the answer: just barely if they weren't raking in payments in Euros. We had to stir into this odd mix of prices and quality the knowledge that many of the long suffering Croatians (under communism and then more recently, rampant corruption) put a high value on appearances. Even under the meager times of communism, coastal families would save for twice annual clothes shopping trips to Italy. And we were told that on average each Croatian currently owns 2 pieces of property, whether it be vacant land or a house. Hearing that statistic coincided with our own similar perception as several people had commented on going to their little house on an island or their mother trekking out to the country home to pick fruit. One of our standard 'repairs' to broken fittings. Much of off-season coastal Croatia has an odd stillness. Part of it is explained by the fact that we only visit when the hoards of fellow tourists vacate the narrow roads in the fall, when the villages are only peppered with locals and straggler tourists like ourselves. But the stillness isn't only the result of the seasonal census drop as an idleness of the people contributes to the impression. I often and somewhat jealously wondered how so many could have so little to do. It feels like my "To Do" list could continuously occupy a dozen people so how is it they have the luxury or curse of nothing to do especially when so much around them is in disrepair? Even as travelers with our few possessions and obligations, chores are constantly competing to be at the top of the list. There is always another garment or 2 in need of washing; mending or repairs to be made; stretching or exercises that would be of benefit; a partially read book I'd like to finish; Italian words to be reviewed; correspondence to be initiated; and on and on. And yet we see Croatians of all ages just hanging out. Some are socializing, others just staring off into space. The majority of the idle ones are male and we've previously observed that Mediterranean men seem to have long ago mastered the fine art of just coasting, of doing nothing, but even knowing that, the idleness was eye-catching. Occasionally the stillness was broken, as when we came upon a sidewalk cafe that had hit a critical mass of energy so as to take on a lively hum; or around a school when classes let out for the day and waiting parents and grandparents were ready to scoop up the youngsters. 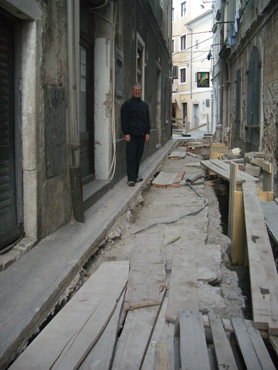 But most of the time in off-season coastal Croatia it was an eerie stillness that prevailed on the streets. I always hoped that inside the stone homes, far from our view, that there was some lively energy, something to counter what appeared to us to be a depressing lack of engagement in the world. Along with a sense of stillness, a disengaged attitude was part of our general impression of the Croatians. But despite that conclusion, we had a couple of chance encounters early in our 2008 visit that were examples of contradictions, of pieces of the puzzle not fitting together. In our first days in northern Croatia while still on the Istrian peninsula, I took a few steps back to a young woman recruiting customers for a boat excursion after politely deflecting her. Her solid command of English and unusually easy manner made it inviting to ask her if there was an internet shop in the village. A scrunched look and pause transitioned into 'I don't think so, not here...' but she quickly followed with an offer to use the system in her home if it was an urgent matter. Fortunately it was not urgent but I savored the kindness--this particularly useful gift had never been so generously offered. It was of course her different affect that had prompted me to ask her about internet access but nonetheless, she was a clear counter to that generally indifferent and passive persona we associate with Croatians interacting with visitors. 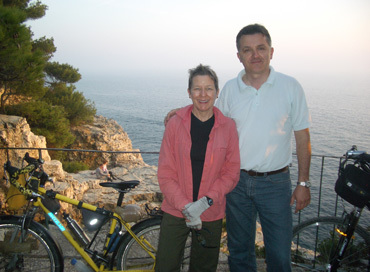 Barb & Dean on the by-bike portion of our Pula tour. A few days later in coastal city of Pula a 30-something man approached us as we were unhappily generating 'Plan D' for finding lodging for the night. Dean offered to lead us in his car to a pocket of rooms and apartments to rent--just what we'd been in search of for over an hour. Over the next 36 hours Dean spent about 8 hours showing us around town by car, on foot, and by bike and answering our many questions about the Croatian culture. One of our critical observations of Croatia in the past had been the lack of industrious of the people compared to their neighbors, like the Slovenians. 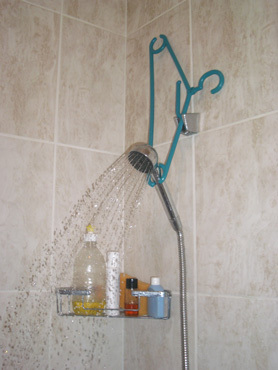 In our minds, the downside of the attitude difference had been low standards of property maintenance, such as the plumbing problems that had us on our hands and knees mopping up after leaking sinks or showers most evenings of the previous week. However we were now the beneficiaries of their different set of priorities--loads of free time to spontaneously splurge on strangers. While talking to Dean for hours in Pula I was especially relieved to hear him validate some of my rather harsh conclusions drawn about Croatia and Croatians in 2007 and on prior visits. In the past we had felt that historical references on plaques and in museums fostered hatred and he concurred. In our chats he volunteered that there were frequent TV programs recounting the evil deeds of their neighbors and urging that Croatians should never forget or forgive those acts. The Aussies halfway through their first cyclo-tour. 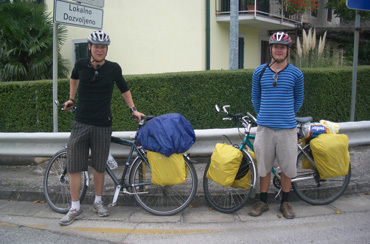 A few days after saying goodbye to Dean in Pula we shared the road for over an hour with two 24 year old Australians on their first cyclotour. Their youth and preference for camping had them chatting with a different crowd than us but they were hearing the same things that we'd surmised before in Croatia--hatred. The age-peer Croatians they talked to spoke of how their parents promoted the hatred of Serbs since they were very young. The Australians continued on about other instances of hatred that they had heard in these, their first days in the country. They were as startled by the contrast with people in neighboring countries as we were. The new insight the Aussises shared that we'd missed was the animosity between the Slovenians and Croatians. None of our experiences had given us a hint of it but our German host in Senj was quick to comment on it too though he was clueless as to the cause. The Aussies who had spoken with age-peer Slovenians had the same conclusion: the hatred level was high and non-specific. When they asked one Slovene youth why he hated Croatians, the answer was "Because they hate us." We also had concluded on prior visits that Croatians were generally a less industrious people than their neighbors the Slovenians and Austrians. Dean didn't offer that specific observation but as a small business owner did comment about his disgust of the general attitude of prospective Croatian employees. He explained that Croatians often live in extended family situations (which we frequently observed) and that when that is the case he finds individuals often only want to work a few hours a week--just enough to have pocket money for the coffee shops and cigarettes and nothing more. He also commented that even in the coastal region where most of the jobs are seasonal that there are sufficient off-season jobs for the people who want to work but not many want to do so. A week later we listened carefully for other opinions with which to refine our Balkan education from a German who had lived in Croatia for the last 15 years. 'Undisciplined' popped out in response to Croatians (and Italians) when we'd asked him to compare his impressions of Slovenians and Croatians. His stories indicated that he shared our opinion: that the stronger Austrian heritage in Slovenia had generally left its people with a more industrious nature than the Croatian people. One of those personal-sized water heaters. Weeks later as we struggled to find private accommodations each night, we again wondered if we were bumping against a lack of Croatian industrious. Amazingly, hosts and hostesses told us that they weren't renting their rooms or apartments because it was low season. As customers on the doorstep, we were perplexed when so many were struggling that they weren't even trying to make a buck. 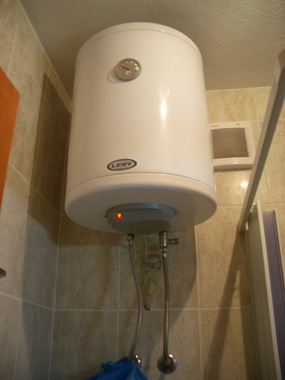 Few Croatian private rooms offered heat and the standard hot water heater was a 'personal-sized' tank that was always shut-off between guests, so there seemed little reason not to take our money and give us the keys. Interestingly, the man of the house generally seemed less willingly than his wife to grab some low season trade and occasionally the hostess would approach us after her husband told us "No." When Bill asked Dean from Pula about Croatia joining the EU we again saw that familiar distrust of what would happen to them, as in the loss of control of their affairs. Curiously he compared Croatia's position to that of Switzerland and Norway, countries that hadn't joined the EU: like them, he thought that it was probably best for Croatia to stay out too. We were intrigued that he and presumably other Croatians were comparing themselves to such prosperous countries with superior infrastructures. Even comparing Croatia to Slovenia is very flattering to much less stable Croatia and in contrast, Slovenia jumped at the chance of EU membership. And I'm sure some would say that Croatia is really more similar to needy prospective members like Bulgaria. Dean, our self-appointed tour guide, considered the best part of moving towards EU membership was the pressure it would create to rout out the corruption between the politicians and organized crime. That is one of the clean-up tasks the EU monitors as a candidate country progresses towards membership and the EU expects the corruption problems to be largely resolved before entry. Dean praised the local police but felt that too often criminals were set free by politicians. Interestingly the German ex-pat living in Croatia echoed the same sentiment: he felt that one's house and car were safe in Croatia and that the most worrisome crime in Croatia occurred at a higher level. Sandwiched between these 2 conversations about 'bigger crime' in Croatia were reports that a newspaper owner with a history of exposing organized crime and corruption was violently killed in Zagreb, the inland capital of Croatia. We were delighted to gain so many unexpected insights from residents and fellow travelers early in this year's Croatia visit. 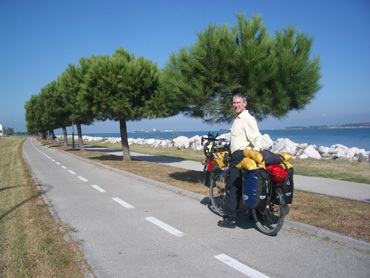 Unfortunately our access to insiders faded and with time we turned our attention to our new plan to blend hiking with biking as we cruised along the Istrian Peninsula and south along the Dalmatian Coast. 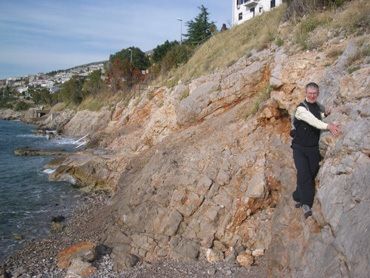 It's not that the hiking venues in Croatia are so grand but that the slopes dropping precipitously to the sea would give us a fine outdoor gym and a new experience of a familiar region. Cross-training by charging up and down tough grades on foot is the most efficient alternate CV exercise we can readily grab. It also gives our bones the pounding they need that cycling lacks as well as joint stabilization training from the challenging descents. 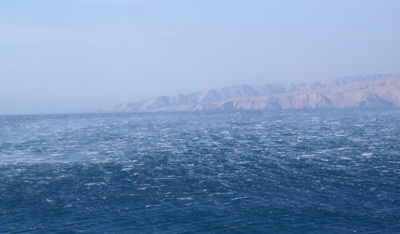 The bura winds whipped spray along the surface of the sea. But the unexpected variable in the itinerary was a virus--a nasty cold. It didn't take steep grades to have us huffing and puffing as just sitting around and breathing was enough to do that some days. Our layover days for hiking became convalescence days. This bug that clasped us for about 2 weeks had a variable grip as our sense of wellness fluctuated by the hour and the day. Three nights was the longest we were going to stay in one place as we tried to ride alternate days during our illness. As lodging availability permitted, Bill broke our itinerary into ever smaller chunks, only riding about 15 miles some days. The undulating road with occasional 10% grades had us taking long breathing breaks even on the shortest days. But the change of scenery was welcome and stimulating the tissues usually supports healing, so we looked at the challenge of riding when ill as being good for both our minds and our bodies. But that brave routine was blown into bits by the dreaded 'bura' winds. We'd encountered those winds our first winter in Croatia and knew they weren't to be messed with. These compelling schedule-busters can last from a few days to 3 weeks. Road closure barricades poised for the bura wind. We were in the small port town of Senj when the winds began blasting down the mountains slopes and our German host alerted us to the danger of the forecast. The 50 mph winds expected by morning reminded me of seeing the movable gates on the road near our apartment with a caravan and a windsock symbols. Our host told the same story (in German) that the nearby signs told: that cars can travel but larger rigs are kept off the road during the wind. We were anxious to move along in hopes of picking up our presidential election ballots but the roads were too narrow and the traffic too treacherous for us as cyclists to add high winds to the mix. Our German hosts took us for a car tour of the adjacent interior region on the first day of the winds and invited us to lunch with them twice. Each morning our host had us review the online wind forecast over his shoulder. A nice apartment, a good grocery store, kind hosts, high winds, and still hacking from our colds we decided to yield. There would still be time to pick up our ballots and get them back to be counted as the 2 night stop became 6 because of the winds. Bill in self-imposed exile on the couch because of his cough. Like the squirrely bura winds, ours was a crazy bug. In addition to our generic responses to respiratory diseases--asthma for me and severe malaise and a prolonged cough for Bill--it also triggered dental pain and a whopping headache. I felt like the roots of all my upper teeth were ablaze while the top half of my head throbbed; for Bill the headache phase was accompanied by raging cold-sensitivity on the surfaces of many of his teeth. Fortunately this 'flourish' was a brief phase in the protracted illness. Had our laptop not been comatose, this down time would have been a perfect interval for wrapping up a multitude of year-end chores. But our laptop's lapse and the paucity of internet shops in Croatia limited our electronics interface to thumb boarding on our PDAs, which is how almost all of these words were recorded. One of the pay-offs from our search for better tourist apartments for our 2008 Croatia stay was the more frequent opportunity for finding English news on the TV. Unlike many countries, satellite TV with sometimes hundreds of stations is often available in Croatia if you secure a little bit better room. My wild guess would be that about 10% of the abodes have "SAT TV", though not all have English news. We took turns pressing through our embarrassment at appearing petty and insisted upon the prospective proprietor proving that their satellite system could produce either CNN or BBC. It commonly took 10 minutes while the host or hostess fiddled with plugs, cables, buttons, and the remote. One man switched satellite boxes between rooms to satisfy Bill's demand; another scampered off for fresh batteries for the remote to make the sale to me. More than we wanted to know. We were chagrinned at the seemingly rude process but loved the result: night after night as we flopped around on the bed or couch hacking and blowing our noses we were also catching up on what we'd missed about the financial meltdown and the presidential elections. We'd been out of the loop too much of the year and by haranguing our Croatian hosts for specific TV stations when shopping for a room we were filling in the gaps. It was a satisfying way to feel like we were accomplishing something during this low-output interval while we waiting out the bura winds. I attempted to soften my embarrassment about being a TV-ogress by explaining to our potential hosts that we wanted to follow the campaign news. But words like "campaign", "president", and "election" weren't in most Croatian's working, second-language vocabulary. I quickly discovered that saying 'Barack Obama and John McCain' did the trick though the lights came on before I got to the second name. I finally realized that no reason was necessary as at least some hosts assumed we were hot to catch a specific soccer match and such an event needed no explanation in Europe. The downside of spending hours a day watching the international news was that it heightened our anxiety about receiving our ballots in time for our vote to count. We had a plan in place: the man who oversees our affairs while we are abroad would forward them to us. But the unfamiliar daily exposure to the tension in the race heightened our sense of urgency. With each story in CNN about creative ways that ex-pats were voting overseas we explored another option to either speed or simplify the process or reduce the cost. We welcomed the information but our poor internet and phone access made it difficult to capitalize on the new options. Our first, failed attempt to mail our ballots home. Interestingly, our German host living in Croatia was convinced that Obama was a Muslim. Having just wrapped up his own discussion about German politics and using the word 'propaganda' it seemed easy to dislodge him from his position by also labeling it as propaganda. We were a bit surprised to learn that this disinformation campaign had made it overseas as we assumed that US citizens alone had been the target of the lies. Long after the stress around our voting process in US presidential election passes, 2008 will be a memorable year for us because of the financial chaos. One of my long standing observations about myself is that I'm often 'right for the wrong reason' and that could be said about choosing 2008 as the year to restudy economics. I selected Alan Greenspan's Age of Turbulence as my one book to carry this year and Bill kindly reduced the significant physical burden by making it our first electronic book. A friend loaned us her DVD economics lecture series, which was outstanding, and luckily we completed it before the laptop fizzled. Bill and I met taking Econ 201 back in 1976, which added to the significance of re-studying the subject together. The DVD lectures were better than our college course and the new professor's biases meshed well with Greenspan's book. 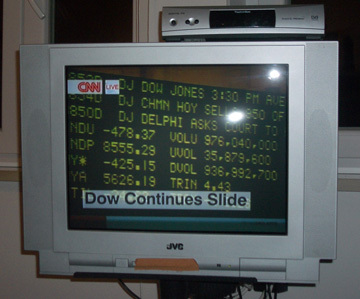 By the time the financial crisis was in full swing we felt much better able to digest the flood of information it generated because of our studies. Catching a more peaceful scene out our window than on TV. Like being abroad during the 9/11 crisis, we concluded that being overseas during the crashing-phase of the financial crisis aided our understanding. CNN International coverage is more similar to BBC World than CNN US and those 2 overseas stations predictably give a more global perspective in the coverage of crises. The international coverage is less sensational and 'doom and gloom' than mainstream US coverage. These overseas networks seem to focus more on generating understanding than creating hysteria. And given that there is rarely anything substantive for the average person to do in response to these monstrous events, keeping calm and deepening one's understanding seems the best strategy. So as we struggled to digest the details that our fellow Americans were also chewing on, like "Just what are derivatives?" we assumed our viewing time was balanced by learning about other arenas not as well covered by the US media, such as the impact of the crisis in Russia, China, and Pakistan. We learned that Russia, which experienced the largest stock market collapse (at least at one point), was doing so because of the unusually high percentage of foreign investors. Infusing state capital into the companies of the now cash-poor oligarchs of Russia was giving Putin a worrisome new, long-term direct control over these men and their businesses. Our view on China took an about-face: we changed from thinking that the country would explode or implode because of poorly managed social issues to believing that the engineers now managing the country might actually be crafting a very successful, customized approach to modernizing the nation. Pakistan was revealed to us as an extremely economically precarious country--we had only thought it to be politically precarious. And so it went: one by one we gained new insight into the unique vulnerabilities of each nation's economics and finances. Germany, France, England, Iceland, Australia, and all the rest were paraded before us and their stories told. It was a relief to focus more on the lessons learned and the special worldwide challenges and less on the individual horror stories that were being emphasized in the US news. The story that wasn't explained and only tracked however was the strengthening value of the dollar. Bill had predicted that reversal as he assumed the US would get a recovery plan in place first so our currency would start recovering first. One by one places with strong currencies that had made us feel like paupers when traveling there, such as Iceland and the UK, saw their currencies nosedive compared to the dollar. Australia was suddenly back on the affordable list too. The dollar was gaining, though not as much, against the Euro, which was good news for us. We were in Croatia when it really rallied and since the Croatian kuna was fixed to the Euro we were directly benefitting from the change. Of course, the rapid pace of change in the global financial crisis would equally rapidly make our new benchmarks learned while in Croatia in October, including the strong dollar, obsolete. Each month would require recalibrating and integrating the latest lessons that the top economists were learning in hindsight. Where We Are Now January 25, 2009: Back Home! We've been back in the States over a month now and a prompt, efficient service call from Dell revived our comatose laptop. Bill has been dominating its use as he has been insisting that "Baby," our Dell laptop, interact politely with her new "Little Brother," our new back-up laptop. After many weeks of scuffling, they seem to be playing nicely now so I can nab some time on one or the other to edit my 2+ months of thumb-boarded text to produce our webpage updates. It's hard to imagine how I'll get them all done before we depart for Europe in early March, but at least this first piece is on its way. We hope where ever you are you are comfortably coping with this winter that is unusually harsh in so many places.